For many years the answer to Qué Pasa in Kyoto would have been “Lo mismo,” same old, same old, but now things are changing. Qué Pasa is a restaurant run by a Japanese chef, Mr. Kurokawa, who lived for 10 years in the bay area of California. This is why he speaks fluent English and makes food that can be said to be the most authentic in Kyoto. This place is all about burritos, and you can have many kinds: you can have them with chicken, pork, and beef. You can even choose your beans and salsa! 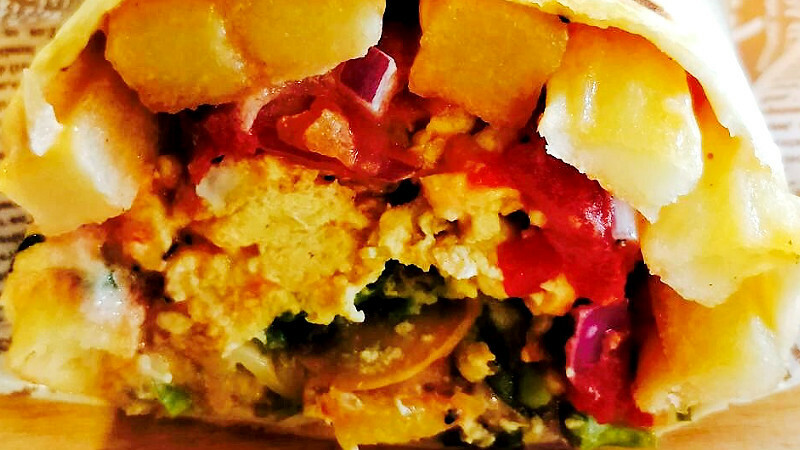 This restaurant also caters to both vegetarians and vegans, and as we had the vegetarian burrito, we can easily rank this restaurant in one of the best not only in the burrito category but also among the restaurants offering vegan food in Kyoto. The obvious star of the show here is the Star Burrito. The way the tortilla of the burrito is lightly grilled just makes the taste just that much better. The burrito contains cheese, lettuce, salsa, sour cream, crunchy stuff, a protein of your choice, and after having one you’ll feel full, but also like you’d want to go for another one of these. 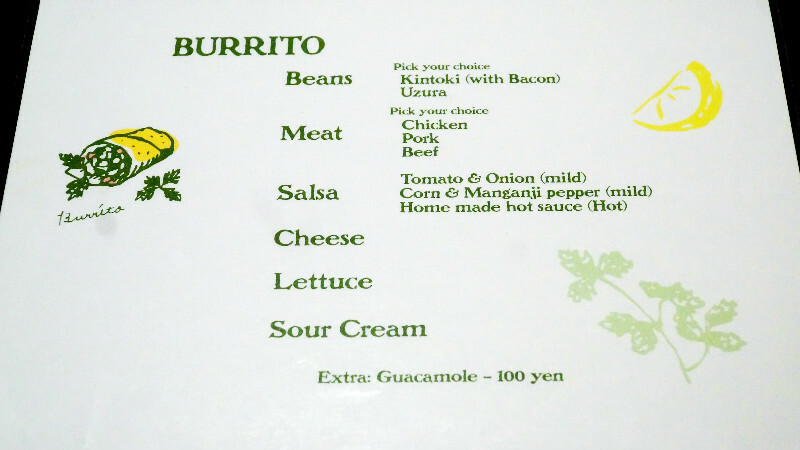 You can have your burrito here in regular size or king size, or if you’re not that hungry, they also have a half-size too (550 yen). The king size is really a big one, as you can probably see from the picture, but the taste is also so darn good that it’s hard not to order the king-sized one. You can also get burritos to go here. I had the vegetarian burrito, and after having it, I was almost ready to give up meat. Quesadillas for 500 yen in Kyoto? Sounds impossible, but Qué Pasa makes impossible possible. The spicy salsa dip deserves a special mention as it’s it hits the perfect combination of flavors with the rich cheese of the quesadillas and the spicy acidity of the salsa. Pax comes from the Thai word for cilantro, and you get a lot of it. As the owner-chef of this restaurant actually also runs a company that’s in the wholesale business of cilantro, the cilantro used in this restaurant is extra-fresh. This is THE alcoholic drink for cilantro lovers. You even get to stir the cocktail with a stick of lemongrass. They also have a Paxsour for 680 yen. In the picture, you can also see a glass of Doctor Pepper. They have root beer too. First choose what type of beans you want, the protein or veg, then salsa, and the size of your burrito, and you’re ready to go. On weekends they also serve breakfast burritos, and you can have a king sized one for breakfast as well, so after having one of these you’ll be sure to have the energy to go sightseeing in Kyoto. The food here is just full of nostalgic tastes you just don’t normally get in Kyoto: sour cream, salsa, Doctor Pepper… and what’s more, the food here is really delicious. I can’t wait to have their breakfast burritos, which they serve only on weekends. The restaurant’s location might not be the most convenient one, but the taste is pretty much ideal. Just writing this I started wanting a burrito… preferably a king sized one. The restaurant is 300 meters from Keihan Jingu-Marutamachi Station. Tuesdays: Lunch: 11:30 a.m.-2:30 p.m. and dinner: 5:30 p.m.-11:30 p.m. Wednesdays, and Friday to Sunday: Lunch: 11:30 a.m.-2:30 p.m. and dinner: 5:30 p.m.-9:30 p.m. Thursdays: Not open for lunch, dinner from 5:30 p.m. to 9:30 p.m. On weekends Qué Pasa opens at 10:00 a.m. and serves breakfast burritos in the morning! Mondays for the whole day and Thursdays for lunch. They are open later than normal on Tuesdays. The owner speaks perfect English and even some Spanish so one of the best in town. Japanese, English, and some Spanish.